They trekked snow-covered mountains, gasped at seals flopping along the coastline and oohed at penguins waddling along on the ice, and even took in the spectacle of a humpback whale flapping its tail amid a sea of melting icebergs. But then, the dozens of tourists stranded on a cruise ship at the end of the world could only stare up at the sky, waiting for several days of thick fog to clear so they could go home. "In Antarctica, you can plan all you like, but you can't really schedule anything," goes a local saying. It's the last terrestrial tourism frontier that nature lovers, adventurers and explorers are rushing to visit. This tourist season, which runs November through March, more than 37,000 people are expected to visit the coldest continent on Earth, about 10 percent more than last season. While some tourists climb Mount Vinson, Antarctica's highest point at 16,050 feet (4,892 meters), others seek a chance to take in the views of other-worldly terrain or snap pictures of massive groups of penguins as they bop in and out of the water. Still others do extreme sports, like scuba diving in icy waters, or imagine themselves as early 20th century explorers during reenactment expeditions. High-profile visitors of recent years include Bill Gates and Prince Harry, while heavy-metal band Metallica rocked out for a small group of fans at the Carlini Argentine Base here in 2013. No matter the draw, a strong dose of humor, patience and humility, not to mention tens of thousands of dollars, are an essential part of any Antarctica vacation. Without fail, every year some tourists are left waiting for the sun to come out, or for a patchy Internet connection to work, or even for help to get their stuck boots dislodged from the ice. "Was it worth it? Yes, of course it was," said English tourist Christine Brannan, 65, recently holed up on the cruise ship. "But I would say to anybody who wants to do the flight and cruise to be aware of the unpredictability." "It's been fantastic," chimed in husband John as the couple walked with other tourists to the airstrip. "It's something we'll never forget." Antarctica is roughly the size of United States and Mexico combined, but tourists and the 4,000 or so scientists who live here part of the year mostly keep to areas that aren't permanently frozen and where wildlife can be found. Those areas account for less than 2 percent of the continent. 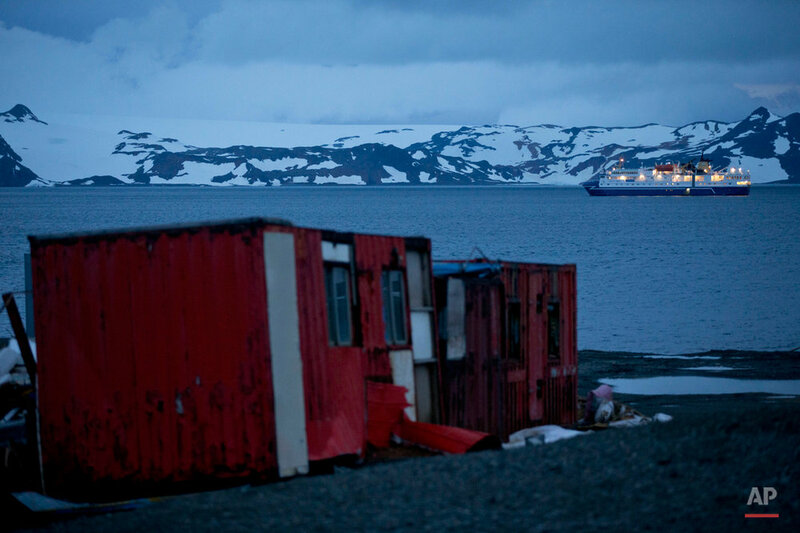 Most visitors arrive on the Antarctic Peninsula, accessible from southern Argentina and Chile by plane or ship. The next most popular destination is the Ross Sea on the opposite side of the continent, which visitors reach after sailing 10 days from New Zealand or Australia. The harsh environment requires vacationers to come with many essentials: water-resistant hiking boots, several layers of winter clothes including long underwear and a parka, and powerful sun lotion and dark shades with extra ultraviolet protection. "I was awed by everything," said Maria Estela Dorion, a retired nurse from Chile. "The snow-covered mountains, the sunsets, the sunrises. There are no words to describe Antarctica." Although many tourists are well-heeled retirees who mostly stay aboard cruise ships, conservationists worry about potentially devastating environmental damage from boat pollution and from the more adventurous visitors who hike or cross-country ski around sensitive sites, such as moss beds or bird breeding colonies during the Southern Hemisphere summer, when 24-hour daylight allows unrestricted access. Increasing foot traffic poses "particular risks of disturbance or contamination to some of the last remaining essentially pristine areas on the planet," said Alan Hemmings, an environmental consultant on polar regions. "We should not passively watch Antarctica being turned into a theme park." Hemmings said several countries with territorial claims in Antarctica, such as the United States, Great Britain, Argentina, Chile and others, have signed agreements to regulate tourism, but most are non-binding or nearly impossible to enforce. Many visitors are drawn here by the legacy of the so-called heroic era of Antarctic exploration from 1898 to 1915, when several adventurers braved harsh conditions, and sometimes died, to explore the mysterious continent. Antarctica is not for budget travelers, and the sky is the limit when it comes to cost. At the top end, chartering a 114-foot yacht (35-meter) in Antarctica costs about $53,000 per week, while a 460-foot yacht (140-meter) runs more than $1 million a week, according to estimates by Superyachts.com. Tim Johnson, the founder of London-based TBJ Super Yachts, said demand is rising every year for clients wanting to explore "unchartered territory" in style. "This is the last frontier on the planet," he said. For those not quite part of the 1 percent, a 14-day expedition on the National Geographic Explorer ship costs between $12,000 and $24,000. A more affordable option is Antarctica XXI, which offers plane and cruise ship trips starting at $10,000 for six nights, which is on top of the cost to fly to southern Chile. Most tourists sleep on their cruise ships, which offer a bevy of fine-dining options and on-board entertainment between several excursions to see the landscapes and animals. No matter how tourists arrive, weather delays are the norm. During the recent patch of heavy fog, for six days planes could not take off or land on King George, leaving guides to deal with more than 100 frustrated tourists. Despite the unpredictable weather and high costs, tourism in Antarctica has become increasingly popular since the 1980s, when on average less than 2,000 visitors came per year. The peak was in 2007-2008, when 46,000 people visited, according to the Rhode Island-based International Association of Antarctica Tour Operators. "It's definitely on many people's bucket list," said Steven Cowpe, who leads expeditions for Antarctica Bound, a United Kingdom-based travel agency. "You feel like you're at the end of the planet because it's so wild and when you come back, you feel like you have achieved something great, even if you're not an explorer." 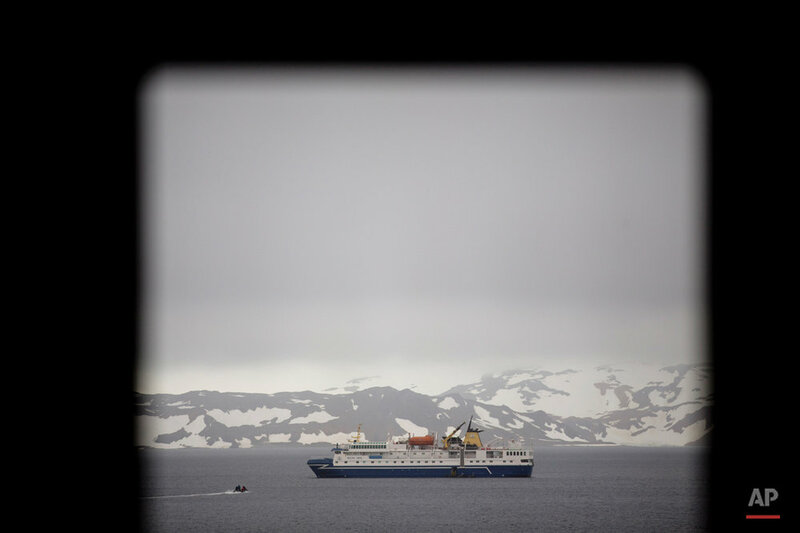 Text from the AP news story, Antarctica tourists: Be prepared for the wild and unexpected, by Luis Andres Henao.